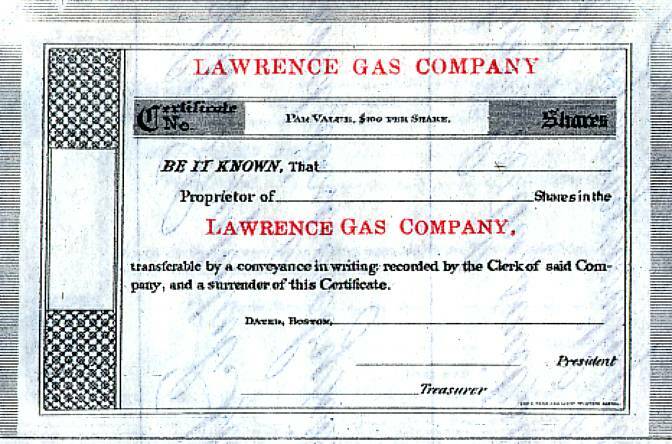 Beautifully engraved specimen certificate from the Lawrence Gas and Electric Company around 1915. 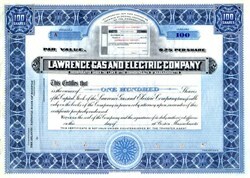 This historic document was printed by the John A. Lowell Banknote Company and has an ornate border around it with a vignette of the Company's previous stock certificate. It was reported that in 1898, the Lawrence Gas and Electric Light Company had a capital of more than half a million dollars, and manufactures annually 80,000,000 cubic feet of gas, furnishes 8,500 16-candle power lights, and 450 arc lamps.